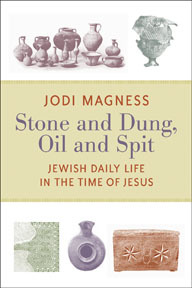 Eerdmans’ blog ErdWorld has a nice book notice for Jodi Magness’ new book, Stone and Dung, Oil and Spit: Jewish Daily Life in the Time of Jesus. Aside from having of the best titles in the history of books on archeology, the book will be a contribution to our knowledge of regular life in the first century. Too many pastors rely on Edersheim’s outdated Life of Jesus the Messiah and simply pass along information which is late in origin and not at all reflective of the Second Temple Period. Jeremias’ classic Jerusalem at the Time of Jesus is better, but in need of an update which take into consideration recent archaeology. Magness says that she examines “various aspects of Jewish daily life in the time of Jesus based on a combination of archaeological evidence and literary information, including ritual purification, diet, household vessels, dining customs, Sabbath observance, fasting, coins, clothing, oil, spit, toilet habits, and tombs and burial customs.” Having read Magness’ fine book on the archaeology of Qumran, I expect a highly detailed and well research collection of essays on the archaeology of the Second Temple Period. I look forward to this book as a detailed update to Jeremias and will post a full review in the future. I am glad to be back at the Psalms on Sunday Night. While I appreciate the break, I miss the regular work in the Hebrew Bible. Let me take a moment and review the point of the series. I am reading through the 14 Psalms which have a header relating to the life of David. Each Sunday evening I examine the context in 1-2 Samuel then reflect on how David responds to a historical situation in worship. When I introduced the series I admitted that these Psalms might very well have been written much later, but the assumption of the Psalm header is that they related to these episodes. I am choosing to “stay within the world of the story” as an exegetical strategy. This Psalm is a bit different since it refers to events which are not particularly well described in the 2 Samuel 8. That chapter is an appendix listing the various conquests of David without much detail. Psalm 60 indicates that David did always defeat his enemies, in fact, the Edomites have routed David’s army, prompting the Psalmist to cry out to the Lord for deliverance. In this case the header informs the reader of a bit more than the text of 2 Sam 8. Because Israel has been defeated, the Psalmist believes that God has rejected Israel and he is now fighting for the enemy (vs 1, 11). The verb זנח (zanach) appears in the quite a few times in the Psalms to describe the despair of a worshiper who feels cut off from God completely (Ps 43:2, 44:10, 24). It can be used for the utensils used by King Ahaz for idolatry (they were rejected as unusable for holy purposes, 1 Chron 29:19). The reason for this rejection is that the Lord is angry. Taken along with the cup of wine in verse 3a, this anger is a just judgment on Israel. There have been several times in the history where Israel has broken a clear command of the Lord for the conduct of war and were judged with a defeat (Jericho and Ai, for example). It is possible that Israel has lost the battle against Edom and her allies because David has not conducted the war in an appropriate manner. The only a hint of the reason for the judgment is the header: Joab slew 12000 Edomites in the Valley of Salt. There are no details given and the event is not described as a victory in war against the army of Edom, but simply the killing of Edomites in general. Given Joab’s reputation for violent revenge, it is possible that this slaughter was not considered to be a fair practice of war, perhaps Joab conducted a war against non-participants, killing more than just soldiers, but also women and children. He went beyond the need of killing in war and as a result, Israel was judged. I realize this is speculation, but I think that it is supported by the Psalm header. The verb נכה (nacah) is common and mean anything from tapping something to violent killing and slaughter. For example, “to rout violently; to cause a great bloodbath,” (Esther 9:5, see HALOT). Recall that Joab is the man who assassinated Abner, the commander of the army of Israel during the brief civil war and later drove his own troops into the walls of Ammon in order to kill Uriah. He will also assassinate his own replacement after David removes him as commander after Absalom’s revolt. It is possible that the “Valley of Salt” refers to the Arabah, the extreme southern border of Judah and a region often inhabited by Edomites. Joab may have attacked settlements indiscriminately, incurring the wrath of God on Israel for improper conduct of war. If this is on the right track, then God is justly punishing Israel for their conduct of a war against an enemy. This Psalm would therefore be part of a “theology of war” in the Hebrew Bible which limits proper conduct of war in important ways – God does not justify the indiscriminate killing of civilians and he will punish those who conduct war improperly. I do not think that it is any coincidence, but Zondervan is giving away a copy of Hell Under Fire. This book came out in 2004 and should get a nice bump in sales in the wake of the release of Rob bell’s Love Wins. Hell Under Fire is a collection of essays on the topic of Hell from the perspective of historical systematic and biblical theology. The final chapter is a nice reflection on preaching the topic of hell (or not). The title is not supposed to be funny; this book is part of a mini-series from Zondervan. Jesus Under Fire was a collection of essays written in response to Jesus Seminar style Historical Jesus studies and God Under Fire was written in response to so-called Open Theism. There are ten chapters, 259 pages. A topical index is included. J. I. Packer: Universalism: Will Everyone Ultimately be Saved? Christopher W. Morgan: Annihilationism: Will the Unsaved Be Punished Forever? Even if you do not win a copy, check out this important resource. 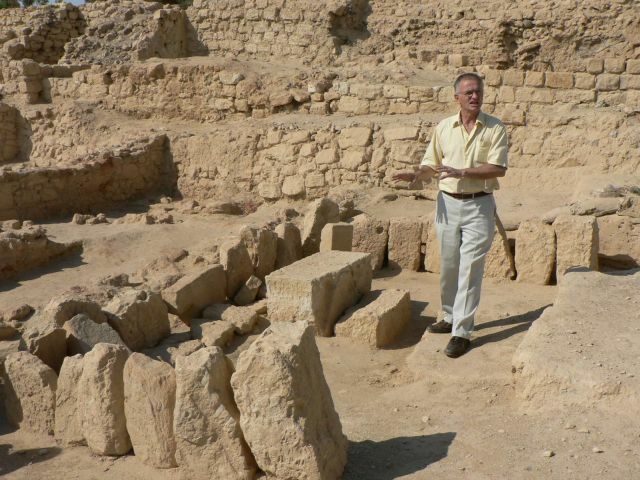 Lystra was an important Roman colony, having been established by Augustus in 26 B.C. The location of the city was clearly established when an inscription was discovered in 1885 (including the full name of the city was Julia Felix Geminia Lustra.) Among the many inscriptions associated with Lystra is a dedication to Zeus of a statue of Hermes. There are other inscriptions which mention priests of Zeus and an altar dedicated to the “hearer of prayer,” presumably Zeus (Witherington, Acts, 422. ). 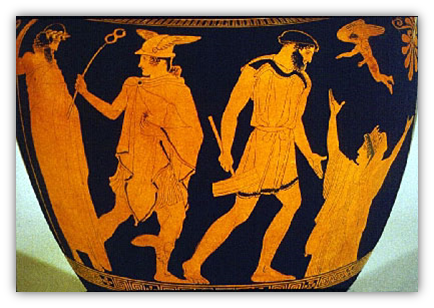 The local Zeus was known as Zeus Ampelites and was pictured as an elderly man with a beard, accompanied by Hermes, a young male assistant (The krater to the left depicts Zeus and Hermes in this way, althoug it dates to about 450 B.C.) Witherington suggests that we have a hint of the relative ages of Barnabas (called Zeus here) and Paul; Barnabas was the elder, Paul was likely no more than 40 by this time. Paul heals a man who was crippled in the feet. When he heals the man he creates a sensation, and a crowd forms claiming that the gods have come in human form. Paul is called Hermes, (or Mercurias in the Latin, KJV, the Greek is Hermes). Hermes was the messenger of the gods, Paul is given this name because he was the chief spokesperson. Barnabas is called Zeus (or Jupiter, Latin, KJV), Zeus was the “father” of the gods. Why does the crowd make the connection between Paul and Hermes? There is a legend which may shed some light on this incident. In Ovid, Metamorphoses 8.626ff there is a legend that Zeus and Hermes had visited the towns and villages of the region in human form, but did not receive any hospitality. When they came to the home of the poor and elderly Baucis and Philemon they were invited in, the couple gave them the last of their food and the best comfort they could. As Baucis prepared the meal, there was plenty of food and the wine kept “welling up of itself.” The couple became greatly afraid because of the miracle, so the gods revealed themselves and told them that they were the only people to welcome them; they would be blessed while the whole region was destroyed. The couple asked only to be priests in the temple of Zeus and that they die at the same time, so that neither had to see the tomb of the other. Paul spoke Greek, but the crowd spoke in the Lycaonian language. As a result, Paul and Barnabas do not know what is going on! The crowd swells and preparations for sacrifices are made by the Priest of Zeus. The Temple of Zeus was just outside, the city, perhaps on the main road into the city. Bulls and wreaths are brought for the sacrifices (the wreaths were flowery decorations for the bulls). Notice that in the Ahenobarbus altar relief (right, click to enlarge), pigs are shown. Pigs were sacrifices to Ares / Mars, so it is unlikely a pig was in this procession. If there is any connection between this story and the legend from Ovid mentioned above, then it is quite likely that the crowd was not going to allow Zeus to visit them again without proper worship. What is the point of this story in Acts? As far as we know in Acts, this is the first time Paul has preached the gospel to an entirely pagan audience. The miracle generates a crowd which thinks Paul is a god. There are priests there as well as people about to honor Paul and Barnabas as a pagan god. This is not a comfortable synagogue where people are ready to discuss what the scripture might say about the Christ. These people are as unprepared for the gospel as could be imagined! Paul’s sermon will therefore need to be much different than what we read in Acts 13. Here, he must contextualize the gospel for a pagan world. This is another opportunity to think about applying the book of Acts – should Paul’s sermon in Acts 14 be used as a model for contextualizing the preaching of the Gospel today?